Winter vacation getaways are very popular during the months of January and February as many Americans embark on destinations to either warmer tropical locations or popular skiing resorts. Whether your winter getaway is taking you to balmy beaches of Costa Rica, Bora Bora, St. Martin and Playa Del Carmen this year, or to the spectacular slopes of Aspen, Lake Tahoe and Whistler, you’ll want to arrive perfectly on time. At The Watchery, we’ve gatthered a special collection of timepieces for men and women expressly designed for air, land and sea getaways. 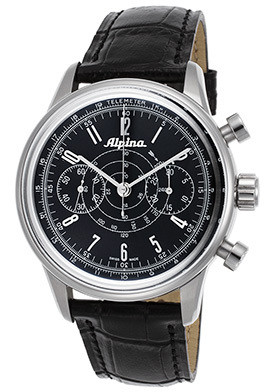 The Alpina Pilot Heritage Automatic Chronograph is an outstanding aviation watch choice for men. This premium crafted Swiss-made men’s watch pays homage to the brand’s early pilot’s watches with an intricate black dial, featuring a telemeter outer dial, integrated small-second and 30-minute sub-dials, along with polished silver-tone baton hands and white Arabic numeral hour markers. The premium grade stainless steel case in a satiny brushed finish is presented on a handsome crocodile-textured black leather strap. An exhibition skeleton case back lets you see the intricate automatic movement inside. Features include a scratch resistant sapphire crystal above the dial and water-resistance to 50 meters or 165 feet. The Alpina Pilot Heritage Automatic men’s chronograph is 42mm in diameter and 14mm thick. The Tissot T-Touch Diamond women’s watch is certain to make your wrist soar to new heights. This aviation inspired analog/digital wristwatch features the ultra-light, ultra-durable contoured titanium case and matching multi-link titanium bracelet, highly polished to a lustrous glow. The bidirectional rotating bezel with engraved compass points surround the iridescent Mother-of-Pearl dial with diamond markers, luminous hands along with compass, telemeter, meter, altimeter, chronograph and alarm digital read-outs. Features include premium Swiss-made quartz movement inside, a scratch resistant sapphire crystal above the dial and water-resistance to 100 meters or 330 feet. 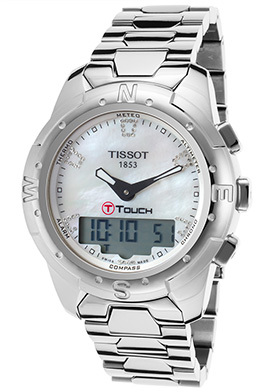 The Tissot T-Touch Diamond women’s watch is 43mm in diameter and 15mm thick. The Porsche Design Flat Six Automatic Chronograph is an excellent racing inspired men’s timepiece for your winter getaway, no matter is your touring the German Autobahn or cruising down the California highway. This high-performance Swiss-made men’s watch features the contoured round case and matching multi-link bracelet in brushed and polished stainless steel. A push-button clasp on the bracelet provides added convenience. An exhibition skeleton case back lets you see the automatic movement inside. The intricate black dial has a tachymeter outer dial, three sub-dials, luminous sword hands, luminous white baton and Arabic numeral hour markers. Features include an automatic day-of-the-week and date calendar at the 3 o’clock hour, small-second, 30-minute and 12-hour countdown timers. Additional features include a scratch resistant sapphire crystal above the dial and water-resistance to 100 meters or 330 feet. 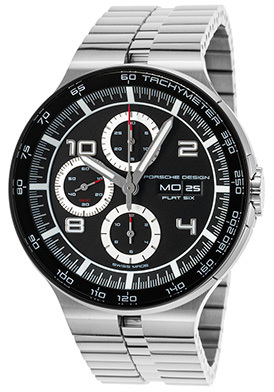 The Porsche Design Flat Six Automatic Chronograph is 44mm in diameter and 15mm thick. The Maurice Lacroix Miros Diamond Chronograph is a spectacular racing-inspired wristwatch for women. This Swiss-made women’s timepiece features the generously oversized case in premium grade stainless steel with contrasting brushed and polished surfaces. The crocodile-textured white leather strap adds to the stylish good looks and has a push-button clasp closure for added convenience. The stationary tachymeter bezel with engraved markers surrounds the silver-colored dial with three sub-dials, luminous sword hands, diamond and raised silver-tone Arabic numeral hour markers. Features include an automatic date calendar below the 12 o’clock hour, 1/10th of a second, small-second and 30-minute countdown timers. Premium Swiss-made quartz movement inside assures you of precise time-keeping accuracy. Additional features include a scratch resistant sapphire crystal above the dial and water-resistance to 100 meters or 330 feet. 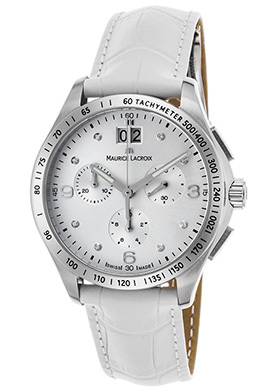 The Maurice Lacroix Miros Diamond Chronograph is 38mm in diameter and 11mm thick. The Invicta Limited-Edition Jason Taylor Chronograph is an extraordinary diver’s watch with water-resistance to an astounding 500 meters or 1,650 feet. The robust, contoured round case in black ion-plated stainless steel has a satiny brushed finish. The high-performance black polyurethane strap with black ion-plated stainless steel accents adds to the bold, masculine design. 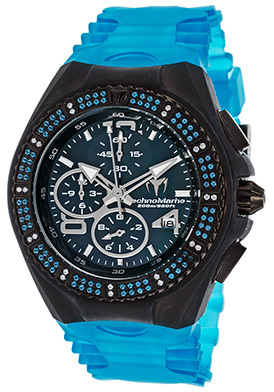 The unidirectional rotating black ion-plated stainless steel bezel with engraved markers surrounds the blue carbon fiber dial with 1/10th of second, small-second and 30-minute sub-dials, date and day-of-the-week windows, luminous blue outlined sword hands and blue outlined Arabic numeral hour markers. Features include premium Swiss-made quartz movement inside, a scratch resistant Flame Fusion crystal above the dial. 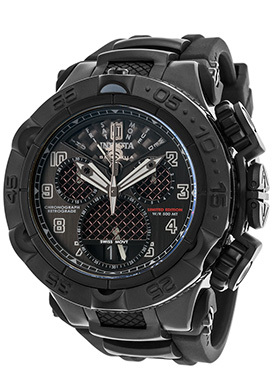 The Invicta Limited-Edition Jason Taylor men’s chronograph is 50mm in diameter and 21mm thick. The TechnoMarine Cruise Gem Diamond Chronograph for women captures the sparkling allure of a beachside resort with 22 shimmering white diamonds and 96 captivating blue topaz stones create a dramatic focal point on the black ion-plated stainless steel bezel. The contoured round case in lustrous black ion-plated stainless steel is presented on a translucent blue silicone strap. The multi-layered black dial has three sub-dials, luminous silver-tone sword hands, luminous baton and silver-tone Arabic numeral hour markers. Features include an automatic date calendar, 1/10th of a second, small-second and 12-hour countdown timers. Additional features include quality quartz movement inside, along with a locking screw-down crown and case back for water-resistance to 200 meters or 660 feet. The TechnoMarine Cruise Gem Diamond women’s chronograph is 41mm in diameter and 12mm thick. Complimentary shipping and returns are included on all domestic watch purchases within the continental United States at TheWatchery.com. 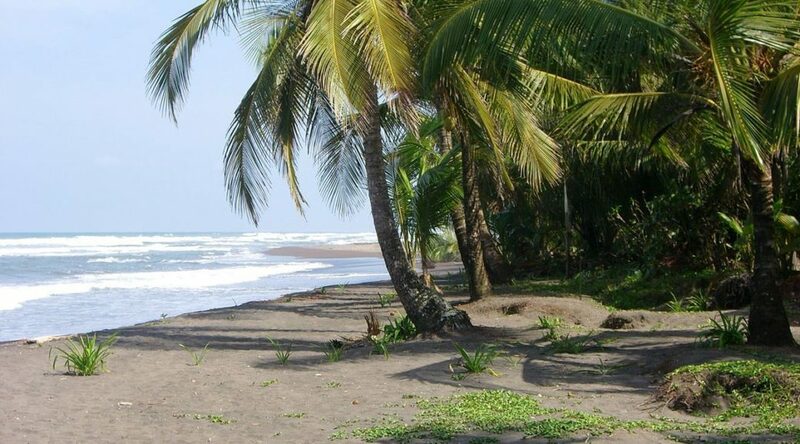 Costa Rica beach scene courtesy of Wiki Commons. 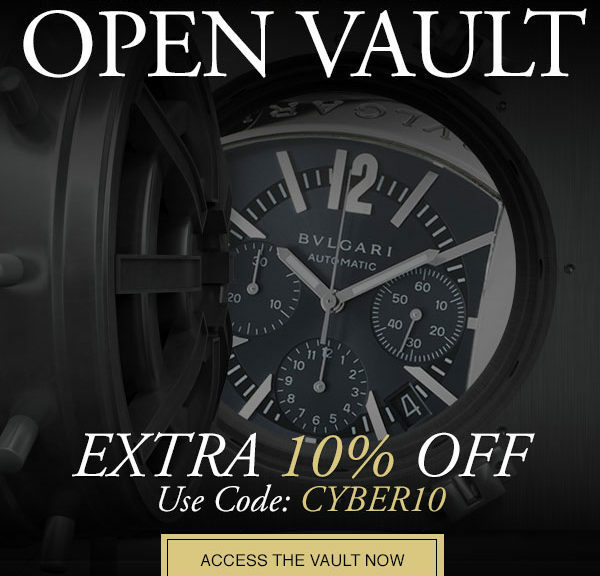 The Cyber-Monday Edition VAULT Is Open! Vaults both big and small are expressly designed to safeguard and protect valuable items, most notably jewelry, currency and fine wristwatches. The prestigious Vault at The Watchery holds some of the best names in horology, which for a limited time are offered at exceptional savings. In commemoration of Cyber Monday, the prized Vault at The Watchery will open tonight from 7pm to 1am EST with amazing jaw-dropping savings on today’s most-wanted watches from TAG Heuer, Maurice Lacroix, Oris, Ebel, Corum, Invicta, Eterna, Breitling, Raymond, Weil, U-Boat, TechnoMarine, Movado, Rolex, Bvlgari, Versace and Bulova Accu-Swiss. In addition, you will save an additional 10% Off of your entire purchase when you use the code CYBER10 at check-out during the limited-time promotion. The TAG Heuer Aquaracer Automatic men’s watch is one of the select items featured in the promotion. This outstanding timepiece is an outstanding diver’s watch with premium Swiss-made automatic movement inside, coupled with a locking screw-down crown and case back for water-resistance to 300 meters or 1,000 feet. The rugged case in premium grade stainless steel has a lustrous polished finish and is presented on the signature triple link stainless steel bracelet in a satiny brushed finish. The signature, twelve sided unidirectional rotating bezel features decorative polished notches and engraved markers. The silver colored dial shines with luminous sword hands and raised luminous hour markers. A window at the 3 o’clock hour reveals the automatic date calendar. Features include a glare-proof, scratch resistant sapphire crystal above the dial and built-in power reserve. 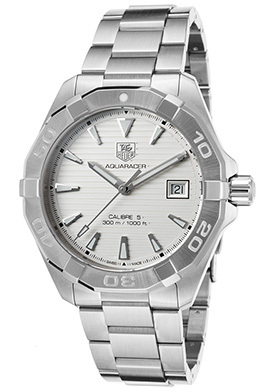 TAG Heuer Aquaracer Automatic men’s watch is 40mm in diameter and 12mm thick. The Eterna Grace Diamond Automatic women’s watch is a splendid selection for women in two-tone stainless steel and diamonds. Shimmering diamonds dramatically accent the sides of the contoured round case in satin-finished rose gold-tone stainless steel. The case is presented on the signature triple link bracelet in brushed stainless steel with polished rose gold-tone center links. The patterned tone-on-tone white dial shines with rose gold-tone sword hands and rose gold-tone studded hour markers. A window at the 3 o’clock hour reveals the automatic date calendar. An exhibition skeleton case back lets you view the intricate Swiss made automatic movement inside. Features include a convenient push-button clasp on the bracelet, a scratch resistant sapphire crystal above the dial and water-resistance to 50 meters or 165 feet. 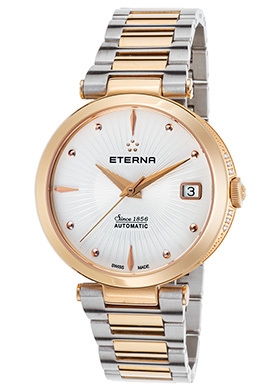 The Eterna Grace Diamond Automatic women’s watch is 34mm in diameter and 9mm thick. 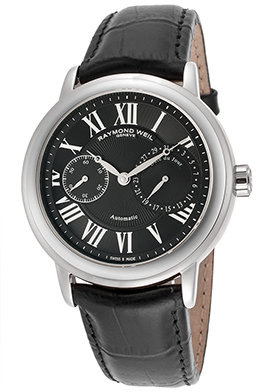 The Raymond Weil Maestro Automatic Watch is another excellent choice for men. This precision crafted Swiss-made timepiece is debonair and sophisticated with a perfectly round case in premium grade stainless steel, highly polished to a lustrous glow. The handsome crocodile-textured black leather strap adds to the elegant good looks. An exhibition skeleton case back lets you see the precision craftsmanship inside. The black dial features a day-of-the-week and small-seconds subdial, silver colored pie cutter hands and luminous Roman numeral hour markers. Features include a scratch resistant sapphire crystal above the dial and water-resistance to 50 meters or 165 feet. The Raymond Weil Maestro Automatic Watch is 41mm in diameter and 11mm thick. 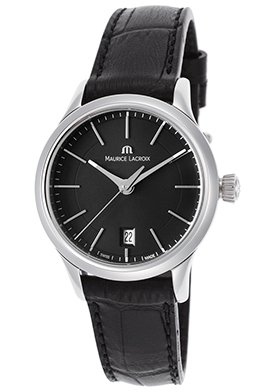 Graceful and refined, the Maurice Lacroix Les Classiques women’s watch strikes a classically elegant note in lustrous stainless steel and supple black leather. The contoured round case in premium gade stainless steel is highly polished to a mirror bright glow. The crocodile textured black leathers trap adds to the timeless traditional styling. Decorative fluted detail accents the onion-shaped crown in polished stainless steel. The legible black dial shines with silver colored luminous baton hands and hour markers. A window at the 6 o’clock hour reveals the automatic date calendar. Premium Swiss-made quartz movement inside assures you of precise time-keeping accuracy. Features include a scratch resistant sapphire crystal above the dial and water-resistance to 30 meters or 100 feet. The Maurice Lacroix Les Classiques women’s watch is 28mm in diameter and 8mm thick. The Invicta Aviator Chronograph is certain to make both your wrist and wallet soar. This vintage inspired timepiece features the black ion-plated stainless steel case, presented on a weathered brown leather strap with contrasting white stitched detail. The legible dark gray dial features threes sub-dials, luminous white sword hands and golden luminous markers. Features include a tachymeter outer dial, an automatic date calendar, small-second, 60-minute and 24-hour countdown timers. Additional features include quality quartz movement inside and water-resistance to 100 meters or 330 feet. 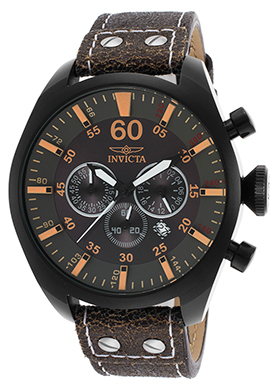 The Invicta Aviator Chronograph is 50mm in diameter and 13mm thick. The TechnoMarine Cruise women’s watch is a lustrous Cyber Monday watch choice in lustrous high-tech ceramic. The contoured round case and matching triple-link bracelet are crafted to perfection in glossy, high-tech black ceramic. The unidirectional rotating bezel in polished stainless steel surrounds the multi-layered black dial with luminous skeleton hands and silver tone hour markers. A window at the 3 o’clock hour reveals the automatic day and date calendar. Features include Swiss-made quartz movement inside for precise time-keeping accuracy, along with a locking screw-down crown and case back for water-resistance to 200 meters or 660 feet. TechnoMarine Cruise women’s watch is 36mm in diameter and 12mm thick. Complimentary delivery and returns are included on all domestic purchases within the continental United States at TheWatchery.com. Whether your journey takes you by land, air or sea, you’ll want a Breitling wristwatch by your side. This prominent Swiss watchmaker is renowned and highly regarded for their precision crafted timepieces and has been the top choice of pilots, deep-sea divers, military servicemen and race car drivers for generations. The brand founded in 1884 by Leon Breitling in Jura Switzerland was instrumental in creating the world’s first independent chronograph push-piece in 1915, as well as creating the second independent push-piece in 1934. Breitling’s onboard aviation chronographs were employed by the British Royal Air Force on fighter planes during World War II. 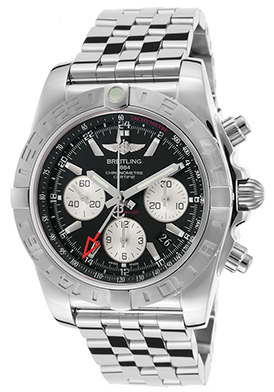 The Breitling brand today holds the distinction of being independently owned and operated. Breitling also holds the honor of being the only watchmaker to submit all of their timepieces: automatic, mechanical and quartz to the Swiss Chronometer Testing Institute for official Chronometer certification. You’ll find an impressive array of Breitling men’s and women’s watches at The Watchery, including highly sought-after styles from the Chronomat, TransOcean, SuperOcean, Colt, Galactic, Windrider, Chronospace and Montbrillant collections. The Breitling Chronomat 44 Automatic GMT Chronometer is the quintessential pilot’s watch. This outstanding automatic men’s chronograph watch features the contoured round case and matching multi-link bracelet in premium grade stainless steel, highly polished to a mirror-bright glow. The bidirectional rotating stainless steel bezel surrounds the black dial with a tachymeter outer dial, three silver-tone sub-dials, a red GMT hand, luminous sword hands and luminous hour markers. Features include a date window at the 4 o’clock hour, small-second, 30-minute and 12-hour registers. Additional features include a 70-hour power reserve, scratch-resistant sapphire crystal above the dial, along with a locking screw-down crown and case back for water-resistance to 200 meters or 660 feet. 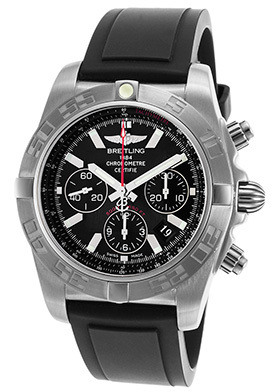 The Breitling Chronomat 44 Automatic GMT men’s chronograph is 44mm in diameter and 16mm thick. 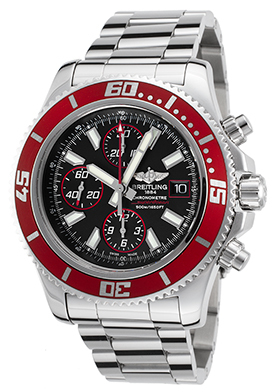 Although the brand is highly regarded for its aviation watches, Breitling also produces exemplary diving watches too. The Breitling Chronomat Evolution Automatic Chronograph is an outstanding diver’s watch with water-resistance to 300 meters or 1,000 feet. This outstanding automatic chronometer features the contoured round case in polished premium grade stainless steel, presented on a high-performance black rubber strap. The unidirectional rotating stainless steel bezel with raised markers surrounds the patterned grey dial with three sub-dials, a date window at the 3 o’clock hour, luminous hands and hour markers. Features include small-second, 30-minute and 12-hour countdown timers. Additional features include a glare proof, scratch resistant sapphire crystal above the dial, along with a locking screw-down crown and case back. 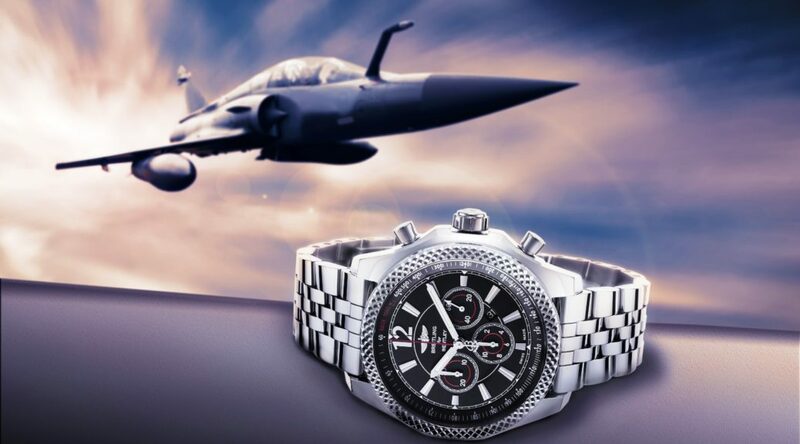 The Breitling Chronomat Evolution Automatic Chronograph is 44mm in diameter and 16mm thick. 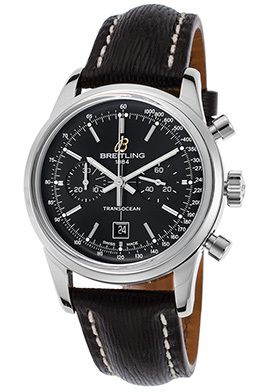 Your wrist will certainly be on the fast track with the Breitling Transocean Automatic Chronograph. This dynamic men’s timepiece has been awarded official Chronometer certification and features a contoured round case in polished premium grade stainless steel, presented on a handsome black leather strap with contrasting white stitched detail. The raised polished steel bezel surrounds the black dial with a tachymeter outer dial, small-second and 30-minute sub-dials, luminous silver colored baton hands and hour markers. A window at the 6 o’clock hour reveals the automatic date calendar. Features include a scratch resistant sapphire crystal above the dial, along with a locking screw-down crown and case back for water-resistance to 100 meters or 330 feet. The Breitling Transocean Automatic Chronograph is 38mm in diameter and 15mm thick. With water-resistance to 500 meters or 1,650 feet the Breitling Limited-Edition SuperOcean Automatic Chronograph is an extraordinary diver’s watch. This premium crafted men’s automatic watch has been awarded official Chronometer certification by the COSC and features the premium grade stainless steel case and matching triple-link bracelet in a highly polished, mirror-bright finish. The unidirectional rotating stainless steel bezel has a coin-edge rim and red top ring with screened markers. The legible black dial features three sub-dials, luminous sword hands and hour markers. Features include an automatic date window at the 3 o’clock hour, 60-second, 30-minute and 12-hour countdown timers. Additional features include a glare proof, scratch resistant sapphire crystal above the dial, along with a locking screw-down crown and case back. 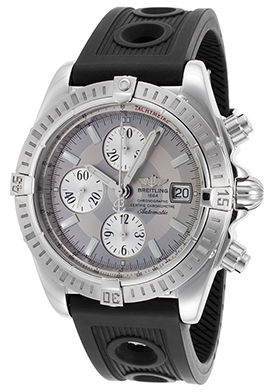 The Breitling Limited-Edition SuperOcean Automatic Chronograph is 44mm in diameter and 17mm thick. 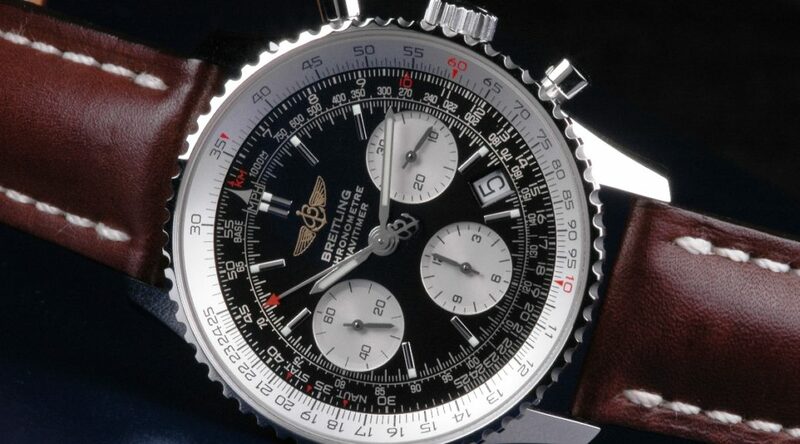 Time For A New Breitling? The expression “timing is everything” as well as “being at the right place at the right time” certainly holds true for Breitling Watches. The brand emerged from a cult-like status as a navigational watch for pilots and aviation aficionados to a highly prominent and popular watch brand in the 1990’s. Although Breitling an independent, family-owned watchmaker for over for over 132 years, increased its brand marketing during this period, it also benefited from an non-official brand ambassador Jerry Seinfeld, who sported many of the brand’s timepieces on his widely popular TV program Seinfeld during this era. Millions of viewers tuned in weekly to the highly rated Seinfeld program, which aired from 1989 to 1997 and had a viewership of 73 million viewers on its final episode in 1997. Seinfeld, an avid Breitling fan owns over 50 different models, which he wore throughout the duration of the show. Today, actor John Travolta, soccer legend David Beckham and hockey player Wayne Gretzky are the current Breitling ambassadors, who appear in the brand’s current display advertisements. Seinfeld can be seen wearing his Breitling collection on syndicated re-runs of his popular show and current online program Comedians In Cars Getting Coffee. 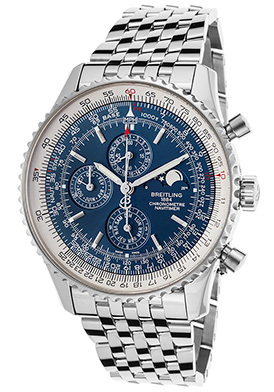 Whether you’re looking a make your first Breitling watch purchase or add another impressive timepiece to your collection, you may want to check out TheWatchery.com this week for Breitling new arrivals for men and women in popular styles from the Navitimer, Transocean, SuperOcean, Chronomat and Galactic collections. The highly pronounced case in premium grade stainless steel and matching multi-link stainless steel bracelet are highly polished to a lustrous glow. The slide-rule bezel with a handsome coin-edge rim surrounds the blue dial with three sub-dials, luminous sword hands and baton hour markers. Features include a moon phase window, small-second/date, 30-minute/month and 12-hour/day registers. Additional features include a glare-proof scratch resistant sapphire crystal above the dial and a 42-hour power reserve. Breitling Navitimer Automatic men’s chronograph is 46mm in diameter, 15mm thick and water-resistant to 30 meters or 100 feet. 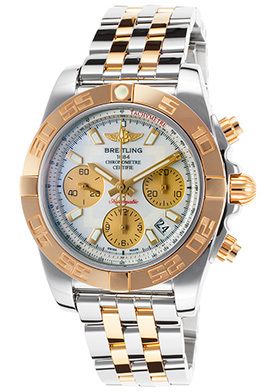 The Breitling Chronomat 41 Chronograph is another outstanding selection. This precision crafted automatic men’s watch is debonair and urbane in premium grade stainless steel and 18K rose gold. The outstanding 41mm diameter, 16mm thick case is polished stainless steel is presented on the handsome vertical-link bracelet in polished stainless steel with 18K rose gold accent links. The unidirectional rotating 18K rose gold bezel with raised markers surrounds the Mother-of-Pearl dial with three sub-dials, luminous sword hands and hour markers. Features include an automatic date window at the 4 o’clock hour, small-second, 30-minute and 12-hour countdown timers. Additional features include an anti-reflective sapphire crystal above the dial, along with a screw-down crown and case back for water-resistance to 300 meters or 1,000 feet. The premium Swiss-made automatic movement inside has a 70-hour power reserve. The Breitling Transocean Automatic Chronograph is another exemplary selection. This elegant and sporty men’s timepiece makes a striking statement on the wrist in premium grade stainless steel and leather. The contoured round case in polished stainless steel is presented on a handsome black leather strap with contrasting white stitched detail. The attractive black dial has a tachymeter outer dial, two sub-dials, luminous silver-tone hands and baton hour markers. Features include a date window at the 6 o’clock hour, small-second and 30-minute countdown timers. Additional features include a scratch resistant sapphire crystal above the dial, along with a locking screw-down crown and case back for water-resistance to 100 meters or 330 feet. Breitling Transocean men’s chronograph is 38mm in diameter and 15mm thick. 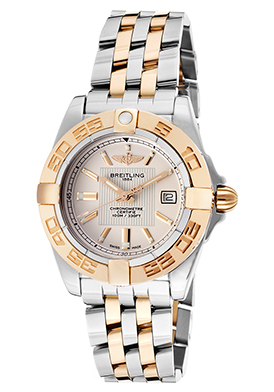 The new Breitling Galactic watch for women is sleekly styled and exceptionally stylish. The classic contemporary styling features the round contoured case in premium grade stainless steel, highly polished to a mirror-bright patina. The attractive vertical link bracelet in polished stainless steel and 18K yellow gold add to the striking design. The 18K yellow gold bezel with raised markers encircles the beige colored dial with a fluted center background, yellow gold-tone luminous hands and hour markers. A window at the 3 o’clock hour reveals the automatic date calendar. Features include a scratch resistant sapphire crystal above the dial, premium Swiss-made quartz movement inside for precise time-keeping accuracy and a locking screw-down crown and case back for water-resistance to 100 meters or 330 feet. The Breitling Galactic watch is 32mm in diameter and 13mm thick. Each Breitling watch featured on this page has been awarded official Chronometer certification from the esteemed COSC (Official Swiss Chronometer Test Institute). Breitling watch image courtesy of Wiki Commons. There’s hope for those of us who have champagne wishes and caviar dreams, but beer bottle and hamburger budgets when it comes to purchasing luxury high-end wristwatches. The pristine pre-owned watch and store display collection available at TheWatchery.com makes purchasing luxury timepieces from Rolex, Cartier, Frank Muller, Corum, Omega and more a highly affordable reality. Luxury wristwatches are very much like high-end automobiles. Both are impeccably crafted inside and out. Each is highly sought-after and desired around the world and each also holds their value better over time. Store-display watches may have never been worn, but they may have surface blemishes such as minor scratches or slight discoloration the leather bands due to exposure from the bright lighting in store showcases and sun exposure in store windows. Both pre-owned and store display timepieces are highlighted this week at TheWatchery.com during our Fall Luxury Time Event. Over 222 prestigious men’s and watches are featured in the promotion, including styles from Rolex, Cartier, De Grisgono, Chanel, Corum, Perrelet, Longines, Chopard, Jaegar-LeCoultre, Bvlgari, Bell & Ross, Rado, Oris, Omega and Frederique Constant. 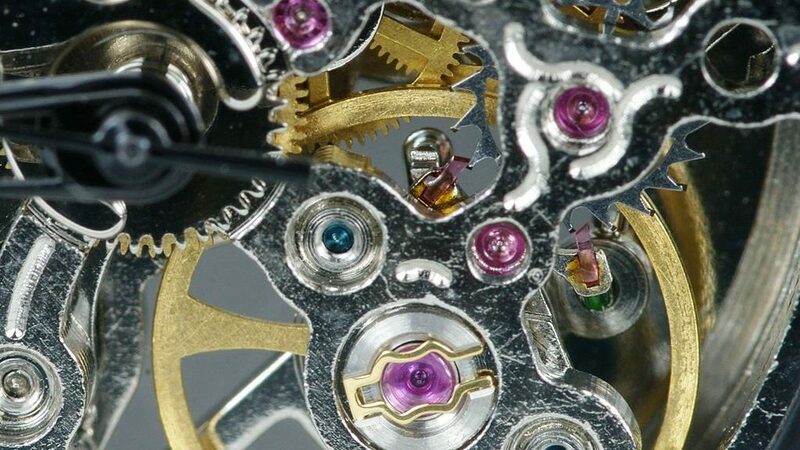 While many of these pre-owned and store display watches may not come with their original packaging, boxes, instructional manuals and manufacturer warranties, they are extraordinary values and come with a 2-year limited warranty provided by TheWatchery.com. In addition, a comprehensive assessment of each watch’s exterior flaws is offered in the product’s description. Rolex is by far the most-wanted brand in the estate watches and the Rolex Datejust Turn-O-Graph Automatic timepiece offers triumphant precision and design. The signature oyster case in premium grade stainless steel has a lustrous polished finish. The highly attractive triple-link bracelet features brushed stainless steel outer links and highly polished 18K yellow gold center links. The bidirectional rotating polished 18K yellow gold bezel with engraved markers surrounds the metallic charcoal sunray dial with luminous baton hands and luminous baton hour markers. A magnified window at the 3 o’clock hour reveals the automatic date calendar. A scratch resistant sapphire crystal covers the dial. The Rolex Datejust Turn-O-Graph automatic men’s watch is 36mm in diameter, 12mm thick and has been awarded official Chronometer certification from the COSC (Official Swiss Chronometer Test Institute). 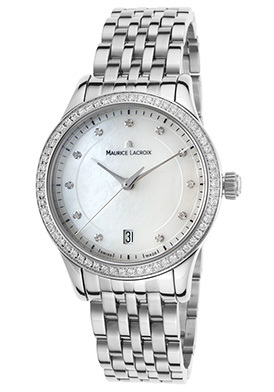 The Maurice Lacroix Less Classiques Diamond watch is a splendid Store Display model. This exquisite Swiss-made women’s dress watch shines in lustrous stainless steel and diamonds. The perfectly round case in premium grade stainless steel is polished to a mirror-bright glow. The captivating multi-link bracelet in brushed and polished stainless steel adds to the classically elegant design. Fifty-four shimmering round-cut diamonds weave intrigue on the perfectly round bezel in lustrous stainless steel. The iridescent Mother-of-Pearl dial shines with polished silver-tone sword hands and eleven inlaid round-cut diamond hour markers. A window at the 6 o’clock hour reveals the automatic date calendar. Features include a scratch resistant sapphire crystal above the dial, quality quartz movement inside for precise time-keeping accuracy and water-resistance to 30 meters or 100 feet. Maurice Lacroix Less Classiques Diamond watch is 33mm in diameter and 8mm thick. The Oris Pro-Diver Automatic Chronograph for men is not only an excellent Store Display model, it’s also an outstanding diver’s watch. The Swiss-made automatic men’s watch features an ultra-durable, ultra-lightweight case in premium titanium with a satiny brushed finish. The high-performance black rubber strap adds to the rugged good looks and has a convenient deployment clasp closure with a wet-suit extension. With water-resistance to 1,000 meters or 3,300 feet the Oris Pro-Diver has a locking screw-down crown and case back. The black ceramic rotating bezel features the Oris patented Rotation Safety System, which lifts and sets the outer bezel timer scale to safely set dive times and ensures the timer cannot be accidentally moved. The automatic helium escape valve offers security when resurfacing from the depths of the deep sea. The legible black dial features an automatic date window, small-second, 30-minute and 12-hour registers, along with luminous hands and hour markers. 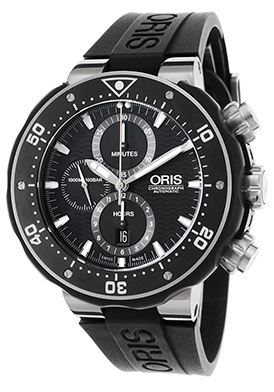 The Oris Pro-Diver Automatic men’s chronograph is 51mm in diameter and 20mm thick. The Omega Constellation Quadrella Diamond watch is a stellar selection. This stunning women’s watch features the lustrous Tonneau shaped case in premium grade stainless steel, presented on the signature horizontal link bracelet with full 18K yellow gold bar accents. Twenty-four sparkling round-cut diamonds, prong-set to perfection in 18K yellow gold dramatically accent the outer corners of the lustrous polished stainless steel bezel. The polished 18K yellow gold crown adds distinction. The luminous Mother-of-Pearl dial glistens with polished yellow gold-tone hands, eight sparkling multi-colored gemstone hour markers and four raised black Roman numeral hour markers. Features include a scratch resistant sapphire crystal above the dial, premium Swiss-made quartz movement for precise time-keeping accuracy and water-resistance to 30 meters or 100 feet. 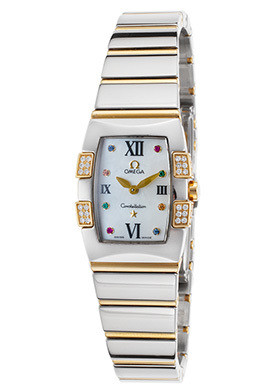 Omega Constellation Quadrella Diamond watch is 20mm wide and 7mm thick. Oris store display image courtesy of Wiki Commons. For generations automatic wristwatches have had a long-standing air of elegance and prestige. The interior self-winding mechanism of an automatic timepiece prominently displays precision craftsmanship and horological excellence at its finest. It is no wonder that watch devotees and collectors prize automatic timepieces far above quartz movement watches. Exemplary, precision crafted automatic timepieces for men and women are highlighted this week at TheWatchery.com with our Put Your Wrist In Automatic: September Automatic Time Event, featuring highly sought-after models from Oris, Porsche Design, Gucci, Lucien Piccard, Swiss Legend, Invicta, TW Steel, Egard, Ritmo Mundo, Bulova Accu-Swiss, Rotary, Ingersoll, Elini Barokas and Rotary. 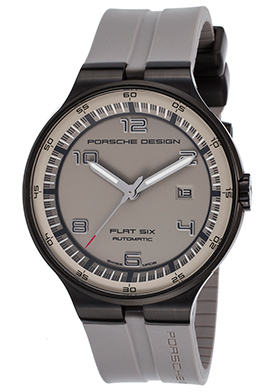 The Porsche Design Flat 6 Automatic Watch is an excellent choice. This premium crafted men’s watch is modern and urbane with a contoured round case in brushed and polished black ion-plated stainless steel, presented on a high-performance gray rubber strap. An exhibition skeleton case back lets you see the intricate, Swiss-made automatic movement inside. The integrated stationary bezel surrounds the gray dial with luminous sword hands, luminous outlined Arabic numeral hour markers and minute outer dial. A window at the 3 o’clock hour reveals the automatic date calendar. Features include a scratch resistant sapphire crystal above the dial, along with a locking screw-down crown and case back for water-resistance to 100 meters or 330 feet. Porsche Design Flat 6 Automatic Watch is 44mm in diameter and 11mm thick. The Oris Artix GT Diamond timepiece is a stunning automatic watch choice for women. This premium Swiss-made wristwatch features the generously oversized case in polished stainless steel, presented on a supple black leather strap with a convenient deployment clasp closure. The stationary black ion-plated stainless steel bezel with engraved countdown markers encircles the black dial with luminous sword hands, twelve shimmering inlaid diamond hour markers and a date window at the 6 o’clock hour. Features include an exhibition skeleton caseback, a scratch resistant sapphire crystal above the dial and water-resistance to 100 meters or 330 feet. 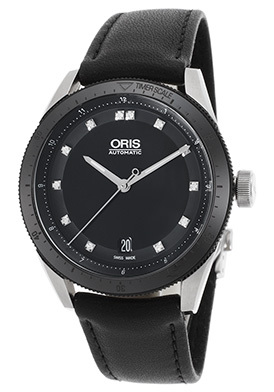 The Oris Artix GT Diamond women’s watch is 37mm in diameter and 11mm thick. 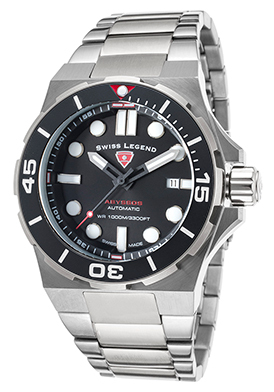 You do not have to look any further than the Swiss Legend Abyssos timepiece for an outstanding automatic diver’s watch. Rugged and masculine, this Swiss-made automatic men’s watch is water-resistant to 1,000 meters or 3,300 feet. The premium grade stainless steel case has a smooth brushed finish and is fully integrated onto the handsome triple-link bracelet in brushed and polished stainless steel. The unidirectional rotating bezel with a black ceramic top ring surrounds the black dial with luminous sword hands, cabochon dot and baton hour markers. A window at the 3 o’clock hour reveals the automatic date calendar. Features include a scratch resistant Sapphitek crystal above the dial, along with a locking screw-down crown and case back. Swiss Legend Abyssos men’s watch is 46mm in diameter and 19mm thick. The Lucien Piccard Acropolis multi-function men’s timepiece offers time-honored, automatic precision matched to classically elegant traditional design. The amply proportioned round case in premium grade stainless steel is highly polished to a mirror bright glow. The handsome crocodile-textured leather strap adds to the timeless design and has a deployment clasp closure for added convenience and security. The stationary integrated bezel surrounds the intricate black dial with day, date, month and 12-hour sub-dials, an open heart window above the 6 o’clock hour, along with rose gold-tone pie cutter hands and raised Roman numeral hour markers. Features include an exhibition skeleton case back, a scratch resistant Sapphitek crystal above the dial and water-resistance to 30 meters or 100 feet. 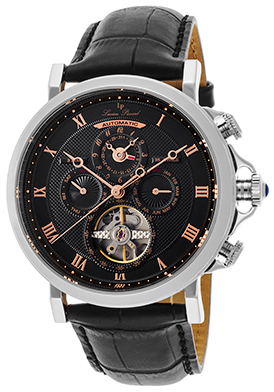 Lucien Piccard Acropolis multi-function men’s watch is 45mm in diameter and 15mm thick. Automatic watch movement interior image courtesy of Wiki Commons. Rolex is by far one of the most sought-after watchmakers in the world today. For generations the brand has been highly regarded and revered for its impeccable craftsmanship and design, making it one of the top watch choices for royalty, heads-of-state, dignitaries and public figures. The brand is also noted for being one of the best watch brands that keeps it value over time and depreciates far less than perhaps other watch brand. Founded in 1905 in London, England by entrepreneurs Hans Wilsdorf and Alfred Davis, the brand was originally conceived as a private label distributor, which imported premium Swiss-made watch movements and housed them in luxury cases that they sold to jewelers, imprinting the establishment’s names on the dials. Wilsdorf and Davis opened a watch production facility in Le Chaux-de Fonds, Switzerland three years later in 1908 and registered the Rolex trademark name that same year, incorporating the standards of their high-end private labels in a new brand that has gone on to become synonymous with time-keeping excellence. In 1910, Rolex was the very first watchmaker to be awarded official Chronometer certification from the highly esteemed COSC (Official Swiss Chronometer Test Institute) for its precision crafted automatic and mechanical timepieces. Today almost all Rolex timepieces feature automatic movements inside and also have official Chronometer certification. 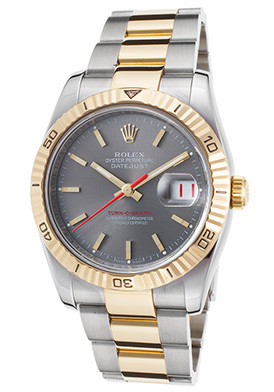 You’ll find many outstanding Rolex watches at TheWatchery.com, including prestigious styles from the esteemed Daytona, Oyster Datejust, Submariner and Yacht-Master Collections. 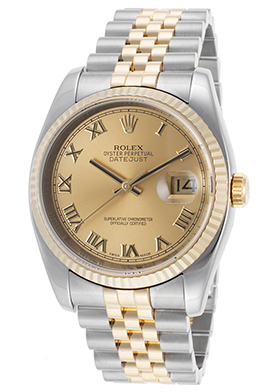 The Rolex Oyster Perpetual Datejust Chronometer for men offers classic, refined elegance at its best. The signature Tonneau shaped Oyster case in premium grade stainless steel has a lustrous polished finish. The handsome Jubilee bracelet in brushed stainless steel is accented by slender polished 18K gold center links. The signature fluted bezel shines in 18K yellow gold. The gold colored metallic dial features a magnified automatic date window at the 3 o’clock hour, polished yellow gold tone baton hands and raised Roman numeral hour markers. Features include a scratch resistant sapphire crystal above the dial, water-resistance to 100 meters or 330 feet and precise automatic movement inside. Rolex Oyster Perpetual Datejust Chronometer is 36mm wide and 12mm thick. The Rolex brand is noted for introducing the first water-resistant watch in 1926 and the Rolex Submariner Men’s Chronometer is an outstanding diver’s watch with water-resistance to 1,000 feet or 300 meters. This high-performance men’s watch features the round contoured case in brushed and polished premium grade stainless steel, presented on the attractive triple-link bracelet in brushed stainless steel with polished 18K yellow gold center links. The 18K yellow gold bezel with a coin edge outer rim and black enamel top ring has screened markers. The highly legible dial features luminous pie-cutter hands, luminous cabochon dot and baton hour markers. A magnified date window at the 3 o’clock hour reveals the automatic date calendar. Features include a glare-proof scratch resistant crystal above the dial, along with a locking screw-down crown and case back. 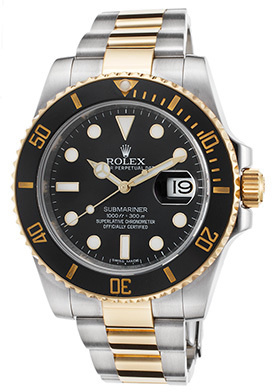 Rolex Submariner Men’s Chronometer is 36mm wide and 12mm thick. The Rolex Yacht-Master Chronometer for men is another outstanding time-keeping choice. This luxury high-end wristwatch features the round contoured case and matching bracelet in polished Rolesium, an exclusive Rolex patented metal featuring a blend of platinum and stainless steel. The bidirectional rotating bezel in platinum has legible raised markers. The silver colored dial has luminous pie-cutter hands, luminous baton and cabochon dot hour markers along with a magnified date window at the 3 o’clock hour. Features include precision Swiss-made automatic movement inside, a scratch resistant sapphire crystal above the dial and water-resistance to 100 meters or 330 feet. 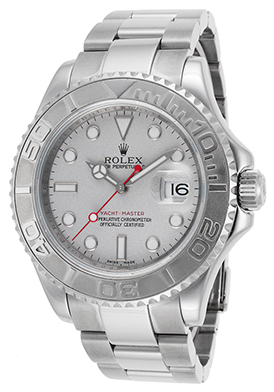 Rolex Yacht-Master men’s chronometer is 40mm in diameter and 12mm thick. The Rolex Daytona Chronograph Chronometer captures the high-speed dynamics of the legendary race track it was names after. Rugged and sophisticated, this highly pronounced men’s watch has a round case in premium grade stainless steel with contrasting brushed and polished surfaces. The triple link bracelet features brushed stainless steel outer links and polished 18K yellow gold center links. The stationary tachymeter bezel in polished 18K yellow gold has black screened markers. The yellow gold colored dial has three sub-dials with black outer rings, luminous hands and hour markers. Features include small-second, 30-minute and 12-hour registers. A scratch resistant sapphire crystal covers the dial. A locking screw-down crown and case back provide water-resistance to 100 meters or 330 feet. 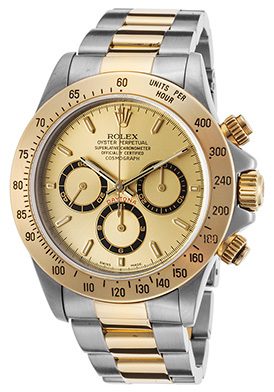 Rolex Daytona men’s chronograph is 39mm in diameter and 13mm thick. Fall Forecast: New Looks For The Season Ahead! 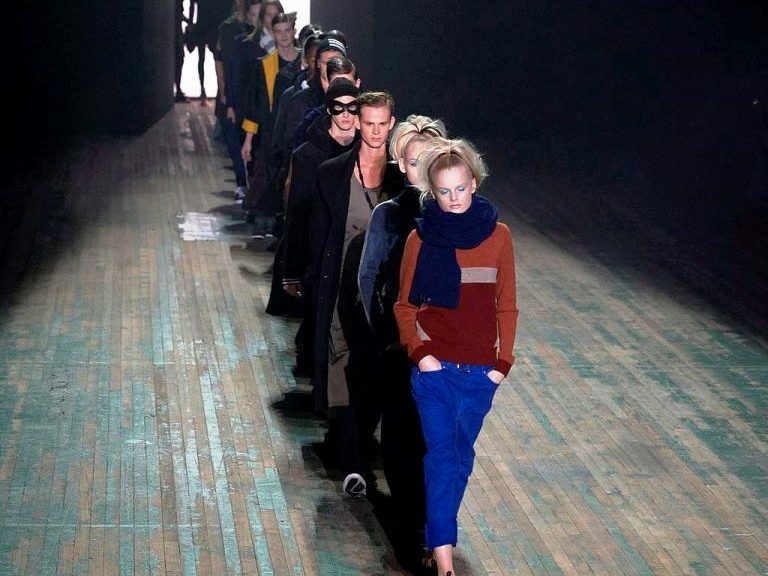 August is always a popular month to get a first look and preview of fashions for the fall and winter seasons ahead. The very latest apparel and accessories are now starting to appear at numerous retailers across the nation as fall looms in the not so distant future. You don’t have to look any further than TheWatchery.com to discover the very latest watch men’s and women’s styles for the forthcoming autumn and winter seasons of 2016. Over 347 brand new styles are featured this week in our August New Arrivals Event, including models from highly sought-after luxury watchmakers: Rado, Breitling, Rolex, Omega, Tissot, Longines, Seiko, Raymond Weil, Movado, Ritmo Mundo, Joshua & Son, Seiko, Lancaster Italy, Luminox, Oris and Burgi. Warm earth tones in shades of olive, copper, rust, diver blue, dark chocolate, flax brown, scarlet red, burgundy, baby blue and dust gray are expected to be popular both this fall and winter season and you will find many new styles at TheWatchery.com in these popular shades. 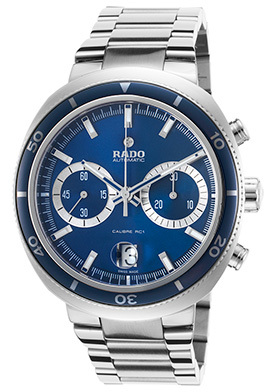 The Rado D-Star 200 Automatic Chronograph with a diver blue colored dial and bezel top ring is an excellent selection. This dynamic Swiss-made men’s diving watch features the contoured cushion-shaped case in polished premium grade stainless steel, presented on a handsome triple-link bracelet in brushed and polished stainless steel with a titanium double-locking clasp closure. The unidirectional rotating bezel features distinctive coin-edge detail on the outer rim. The sunray blue dial has small-second and 30-minute sub-dials, a magnified automatic date window at the 6 o’clock hour, luminous hands and baton hour markers. An exhibition skeleton case back lets you see the intricate Swiss-made automatic inside. Features include a glare-proof, scratch resistant sapphire crystal above the dial, along with a locking screw-down crown and case back for water-resistance to 200 meters or 660 feet. Rado D-Star 200 Automatic men’s chronograph is 44mm wide and 16mm thick. 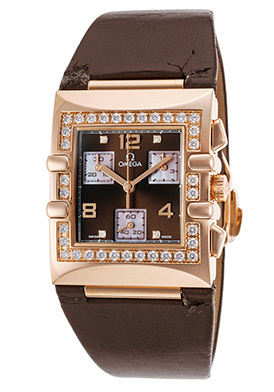 The Omega Constellation Quadra women’s dress watch glistens in diamonds and 18K rose gold with a chocolate brown dial and satin-lined strap. The signature rectangular shaped case in 18K rose gold is highly polished to a lustrous mirror bright glow. The brown satin facing strap has a leather-lined interior and a push-button deployment clasp for added security. Thirty high-quality, round cuts diamonds are pave-set to glowing perfection on the square-shaped bezel in 18K rose gold with four distinctive claw accents. The chocolate brown dial shines with three Mother-of-Pearl sub-dials, rose gold-tone sword hands, four inlaid diamond hour markers and raised rose gold-tone Arabic hour markers. Features include small-second, 30-minute and 12-hour registers. A scratch resistant sapphire crystal covers the dial. Premium Swiss-made quartz movement inside assures you of precise time-keeping accuracy. 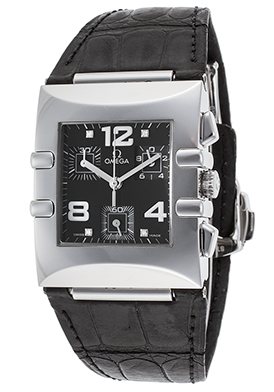 Omega Constellation Quadra women’s watch is 28mm wide, 10mm thick and is water-resistant to 30 meters or 100 feet. The Movado Bold Chronograph for men is masculine and appealing in dusty gray. 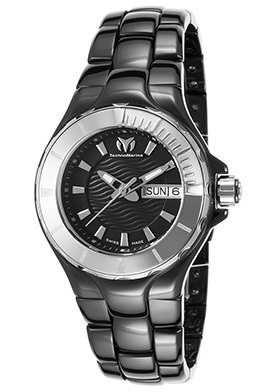 This ultra-sleek men’s watch features the perfectly round case in polished, gray ion-plated stainless steel is presented on the striking multi-link bracelet in gray polyurethane with polished gray ion-plated stainless steel accent links. Bracelet has a push-button deployment clasp for added security and convenience. The stationary gray ion-plated stainless steel bezel surrounds the black dial with updated Movado concave dot at the 12 o’clock hour, three sub-dials encircled in red and polished silver tone sword hands. A window at the 6 o’clock hour reveals the automatic date calendar. Features include a scratch resistant sapphire crystal above the dial, premium Swiss-made quartz movement inside and water-resistance to 30 meters or 100 feet. 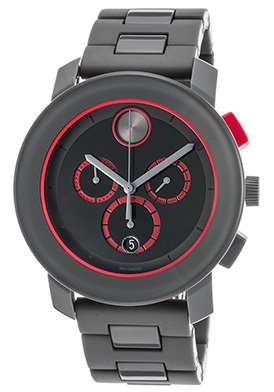 Movado Bold men’s chronograph is 43mm in diameter and 12mm thick. 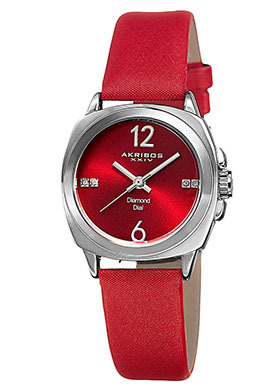 Ultra-chic and at the fashion forefront, the Akribos XXIV Diamond Dial women’s watch is stylish and sophisticated in vibrant scarlet red. The cushion-shaped case in a lustrous silver-tone finish is presented on a bright red satin facing strap with a leather lined interior. The raised perfectly round bezel surrounds the bright red metallic dial with silver-tone sword hands, four diamond markers and raised silver tone Arabic numeral half-hour markers. Quality quartz movement inside provides precise time-keeping accuracy. Akribos XXIV Diamond Dial women’s watch is 41mm in diameter, 14mm thick and is water resistant to 10 meters or approximately 30 feet. The 2016 Summer Olympics is a little more than two weeks away and much speculation has been made if the host city Rio de Janeiro, Brazil will be ready for this major event featuring more than 10,500 athletes from over 206 nations. The games will feature 28 Olympic sports in everything from track and field to swimming and water related sports. Golf and rugby sevens are two new competitions added to the games this year. While many things change with each and every Olympic completion, one thing that has remained the same since 1932: Omega Watches have been the official timekeeper of almost every Olympic completion and will be present at this year’s completion in Rio de Janeiro. Precise, time-keeping accuracy is nothing new to prestigious Swiss watch brand founded in 1848 in La Chaux-de-Fonds, Switzerland. The brand has been revered for their premium crafted timepieces and provided the first watch worn on the moon in 1969: the Omega Speedmaster, during the historic Apollo 11 space mission. You’ll find many precision crafted Omega timepieces for men and women this week at TheWatchery.com with our Omega Best Sellers Event. The Omega Seamaster Aqua Terra Automatic Chronograph is an extraordinary choice and has been worn by record-holding Olympic gold medal winner Michael Phelps, who serves as a brand ambassador for Omega. This high-performance men’s watch features the perfectly round case in premium grade stainless steel and matching triple-link stainless steel bracelet with a satiny brushed finish. The stationary bezel surrounds the black chronograph dial with three sub-dials, luminous sword hands and hour markers. Features include an automatic date window, small-second, 30-minute and 12-hour registers. An exhibition skeleton case back lets you see the intricate Swiss-made automatic movement inside. Additional features include a scratch-resistant sapphire crystal above the dial and water-resistance to 150 meters or 500 feet. 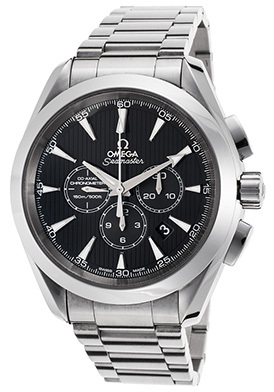 Omega Seamaster men’s chronograph is 44mm in diameter and 14mm thick. 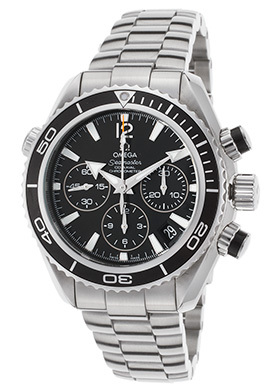 The Omega Seamaster Planet Ocean Automatic Chronograph is an excellent diver’s watch. This outstanding women’s watch has a built-in helium escape valve and is water-resistant to 600 meters. The premium grade stainless steel case with a brushed and polished finish is presented on the signature triple link bracelet with a push-button fold-over safety clasp. The unidirectional rotating bezel with a black enamel top ring surrounds the black dial with three sub-dials, an automatic date window, luminous sword hands and hour markers. Chronograph has small-second, 30-minute and 12-hour registers. An exhibition skeleton case back lets you see the precision automatic movement inside. Features include a glare-proof scratch resistant sapphire crystal covering the dial along with a locking screw-down crown and case back. 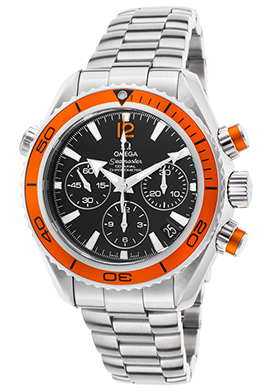 Omega women’s Seamaster chronograph is 37mm in diameter and 16mm thick. 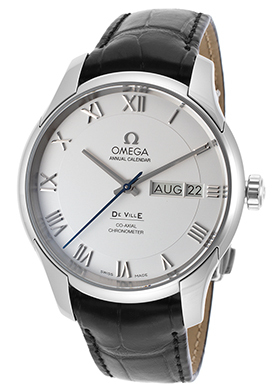 The Omega Deville automatic men’s watch recalls the nostalgic spirit of yesteryear. This classically elegant men’s dress watch features the premium grade stainless steel case in a highly polished mirror-bright finish, presented on the handsome black alligator strap with a convenient deployment clasp. An exhibition skeleton case back lets you the intricate movement inside. The stationary bezel surrounds the silver colored dial with silver-tone baton hands and raised Roman numeral hour markers. A window at the 3 o’clock hour reveals the automatic day and date calendar. Features include a scratch resistant sapphire crystal above the dial and water-resistance to 100 meters. Omega Deville men’s watch is 41mm in diameter, 15mm thick and has been awarded Chronometer Certification from the esteemed COSC (Official Swiss Chronometer Test Institute). The Omega Constellation Quadra women’s chronograph adds a note of assured elegance. This lustrous women’s watch features the rectangular shaped case in highly-polished stainless steel integrated on a textured black leather strap for one flowing line of luxury. The strap has a deployment clasp closure for added convenience. The polished steel bezel with signature claw accents surrounds the black dial with three sub-dials, polished silver tone hands, four sparkling diamond markers and raised Arabic numeral markers. Features include 1/10th of a second, small-second and 30-minute registers. Additional features include a scratch resistant sapphire crystal above the dial and water-resistance to 30-meters. Premium Swiss-made quartz movement inside assures you of precise time-keeping accuracy. Omega Constellation women’s watch is 28mm wide and 10mm thick. As summer is at its peak and both the month of August and the back-to-school season looms in the horizon, many of us are planning late summer getaways to destinations ranging from tropical seaside resorts and mountainous hiking retreats to European tours and Mediterranean cruises. Whether you’re vacationing off the shores of the Virgin Islands or the Greek Isles this late Summer, deep sea diving adventures, water sports and recreation will probably be on your vacation itinerary. There is no better time than now to plan ahead for your forthcoming vacation and find a diving watch to complement your seafaring expeditions. We’ve hand-selected a few of our favorite Diving watches at TheWatchery.com for you from some of the very best names in horology: Breitling, TAG Heuer, Omega and Oris. Not only do each of these premium crafted timepieces features precision Swiss-made automatic movement inside, each is also water-resistant to 500 meters or more. Although Breitling is renowned for its aviator inspired timepieces, the brand’s deep-sea divers’ watches are in a league of their own. The Breitling Chronomat 44 Flying Fish automatic chronograph is an extraordinary diver’s watch with water-resistance to 500 meters or 1,650 feet. This dynamic and vigorous men’s timepiece features the premium grade stainless steel case in a brushed and polished finish, presented on a high-performance black rubber strap. The unidirectional rotating stainless steel bezel with engraved markers surrounds the black dial with three sub-dials, luminous hands and hour markers. Features include an automatic date window, small-second, 30-minute and 12-hour registers. Additional features include a glare-proof, scratch resistant sapphire crystal above the dial, a locking screw-down crown and case back, along with a 70-hour power reserve. Breitling automatic men’s watch is 44mm in diameter, 16mm thick and has been awarded Chronometer Certification from the esteemed COSC (Official Swiss Chronometer Test Institute). In the early 2000’s TAG Heuer set out to create the quintessential diver’s watch series with it Aquaracer timepiece collection. The TAG Heuer Aquaracer Automatic Chronograph for men is an outstanding diver’s watch with water-resistance to 500 meters and a helium escape valve that provides added security when resurfacing from the deep sea. The dynamic titanium carbide coated case in black ion-plated stainless steel case is presented on a durable black rubber strap with striking textured detail and a push-button deployment clasp for added convenience. The titanium unidirectional rotating bezel with engraved markers surrounds the textured black dial with three sub-dials, an automatic date window, luminous baton hands and hour markers. Features include small-second, 30-minute and 12-hour registers. Additional features include a glare-proof sapphire crystal above the dial, locking screw-down crown and case back. 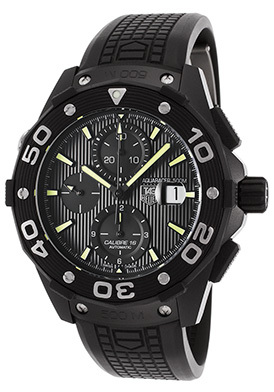 TAG Heuer Aquaracer automatic men’s watch is 44mm in diameter and 16mm thick. 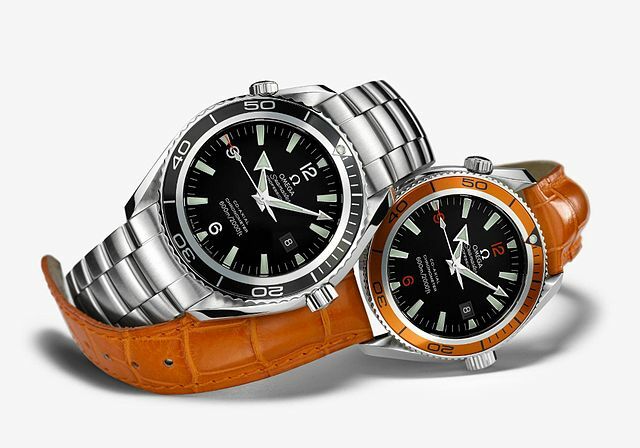 Omega is a brand synonymous with deep-sea diving. The brand’s Seamaster timepiece has been the go-to diver’s watch by professional divers and diving enthusiasts for decades. The Seamaster Planet Ocean Automatic men’s chronograph lives up to its seafaring name with a built-in helium escape valve and water-resistance to 600 meters. The outstanding premium-grade stainless steel case in a brushed and polished finish is presented on the signature triple-link bracelet in brushed and polished stainless steel with a push-button clasp and wet-suit extension. The unidirectional rotating bezel has u-notched outer rim and a bright orange top ring. The legible black dial features small-second, 30-minute and 12-hour sub-dials, along with an automatic date window, luminous sword hands and luminous baton hour markers. Features include a 52-hour power reserve, a scratch resistant sapphire crystal this is glare-proof, along with a locking screw-down crown and case back. Omega Seamaster watch is 38mm in diameter, 16mm thick and has been awarded Chronometer Certification from the COSC. With water-resistance to 1,000 meter or 3,300 feet, the Oris Col Moschin Limited-Edition Titan Pro Diver stands high above the rest. 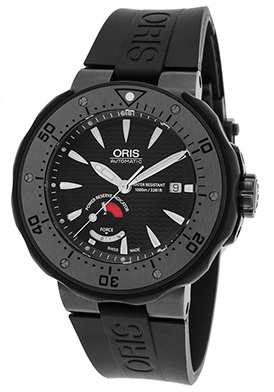 Oris collaborated with the Italian Special Forces regiment to create the ultimate diver’s watch. The robust 48mm diameter, 16mm thick case in ultra-light, ultra-durable titanium case has a brushed gunmetal gray finish. Titanium which is non-corrosive to salt water is considered the best metal for deep-sea diving. The case is presented on the outstanding black rubber strap with an adjustable push-button deployment clasp. The tungsten bidirectional rotating bezel features the Oris patented Rotation Safety System which lifts and sets the outer bezel timer scale to safely set dive times and ensures the timer cannot be accidentally moved. The automatic helium escape valve offers security when resurfacing from the depths of the deep sea. The black dial shines with Super Luminova hands and hour makers, along with a 42-hour power reserve window. The 21-jewel automatic movement inside assures you or precise time-keeping accuracy. Features include a screw-down crown and titanium case back, along with a glare-proof sapphire crystal above the dial. 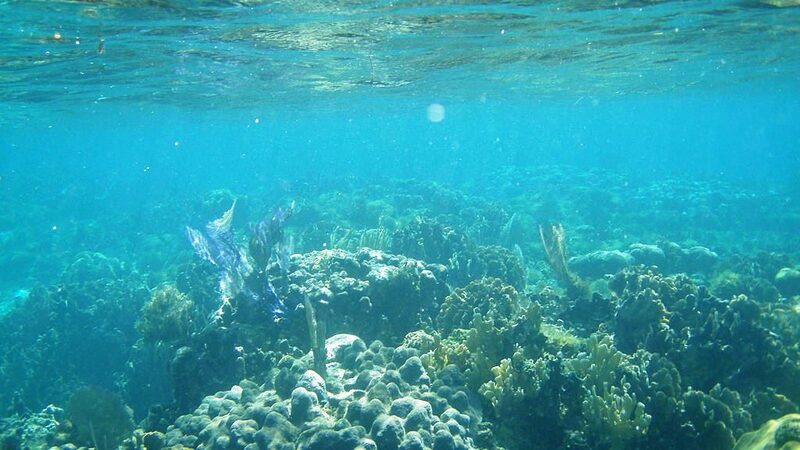 Underwater diving image of deep sea coral in Belize courtesy of Wiki Commons.